Jason Voorhees (Richard Brooker) returns again to Camp Crystal Lake, where he drowned nearly three decades before while some negligent camp counselors made out on the beach. Understandably upset by this turn of events, Jason continues to haunt his old stomping grounds, dealing death to those thrill-seeking teens who venture into the woods. This time around, Jason faces tougher victims in the form of a motorcycle gang and dons what is to become his trademark hockey mask. The original theatrical release featured 3-D effects. In the early Eighties, 3D flicks enjoyed a minor resurgence. They didn’t stick, but we got a smattering of them, some of which inevitably connected to the third movie in a series. 1983’s Jaws 3 and Amityville 3-D tied to this trend, as did one of the earliest of that era’s bunch, 1982’s Friday the 13th Part 3. As occurred with Part 2, Part 3 opens with a recap of the prior chapter’s conclusion. The film then picks up the day after that flick’s events, as we see Jason (Richard Brooker) continue on his vicious path when he slaughters a local couple. From there we meet some college students who plan on a weekend in the country. Where’re they headed? Crystal Lake, of course, the site of the first two movies’ slaughters. They go to a farm owned by the family of Chris (Dana Kimmell), a babe who barely survived an encounter with Jason a couple of years earlier. Our favorite indestructible psycho shows up again and wreaks havoc on the campers and others. It doesn’t take long for us to see the 3D roots of Part 3. The opening credits zoom out at us, and we quickly witness silly gimmicks like poles, snakes and yo-yos that pop out of the screen. These look dopey enough when viewed in the proper 3D presentation, but they become totally absurd if you check out the 2D version also included here. While the 3D of Part 3 never rises above Dr. Tongue levels, at least that element gave the theatrical release something unusual compared to its predecessors. Without the gimmick, Part 3 turns into just another rehash of the first two movies. This makes it a disappointment after the relatively strong Part 2. Yeah, that flick also told the same basic story as the first, but it tightened the general model and provided some decent thrills. In Part 3, the filmmakers totally rely on the 3D gimmicks to entertain the audience, as everything else about the movie lacks creativity. They needed to try harder. Many of the fake-outs and false endings of Part 3 come as genre staples. I can’t really criticize them because they’re expected and appropriate parts of this sort of film. However, it’d be nice to see more imagination in them, as none of those elements stands out as memorable or vivid. Instead, the “twists” are predictable and add no life to the movie. Once again, the majority of the characters are bland beyond belief. Most of them fall into the category of “generic, attractive teen” - couldn’t they find any actresses who didn’t look almost identical? A couple of the males almost rise to the level of two-dimensionality; we get fat nerd Shelly and pot-smoking hippie Chuck. They never turn into anything more than very basic stereotypes, though they still come across as better developed than the other totally forgettable characters. If not for the fact that Jason obtained his signature hockey mask here, absolutely nothing memorable would come from Friday the 13th Part 3. It relied on its wince inducing 3D effects to involve the audience. Those didn’t work theatrically, and when seen in 2D form, the movie becomes even more boring. 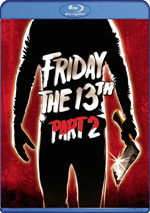 Two versions of Friday the 13th Part 3 appear here. We get the original 3D presentation as well as a 2D representation. Both appear in the 2.35:1 ratio on this Blu-ray disc. The degraded presentation that comes with those blasted 3D glasses makes it more difficult than usual to rate the picture quality of the 3D Part 3 - so I didn’t. It just didn’t make sense for me to try to objectively rate a visual presentation that came with so many inherent flaws. The red/blue 3D glasses meant those hues dominated; anything not red or blue in the film showed up as a neutral tone. The technology used for this kind of 3D work simply made natural colors impossible. The glasses also tended to negatively affect sharpness. While many parts of the 3D presentation showed good delineation, the nature of the material meant the shots occasionally were somewhat blurry. It’s simply a flawed technology, so I didn’t want to saddle it with a grade. Given the potential for the red/blue 3D format, I thought it looked fine within the restrictions of the transfer that will become more apparent when I discuss the 2D version. The 3D effects themselves worked fairly well. Though the gimmicky 3D shots seemed decent, the imagery fared best when it came to a general sense of depth. I thought the flick demonstrated a nice feeling of dimensionality when it came to the interaction of background and foreground elements. If you can suffer through potential side effects, that is. 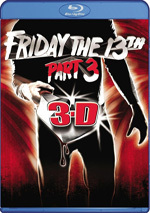 I must admit I didn’t watch all of the 3D Part 3 simply because the presentation gave me a bit of a nasty headache. That left me with the erratic 2D version. Sharpness came across as spotty. More than a few shots looked a bit soft and ill-defined, and the film rarely boasted very good definition. I believe that the 3-D process was responsible for some of these issues. Whatever the case, sharpness was usually fairly mediocre. I noticed no jagged edges or shimmering, and edge enhancement remained minimal. Print flaws created inconsistent concerns. Grain looked heavier than usual, and a mix of spots, specks and marks popped up during the film. It also appeared that the cameras occasionally got dirty, as I sometimes saw small blemishes that seemed native to the original negative. The source defects didn’t become massive, but they were more prominent than during the first two movies. Colors varied. The tones occasionally appeared moderately drab and dull, but the majority of the movie presented reasonably vivid hues. The outdoors shots looked best, as these presented nicely distinctive colors. Blacks were generally solid, though they could be somewhat inky, while shadows tended to come across as a bit dense. They weren’t terrible opaque, but they lacked great clarity. The image of Part 3 fell to “C+” levels, as it always seemed mediocre. At least the Dolby Digital TrueHD 5.1 remix of Part 3 proved to be more satisfying. The soundfield tended toward environmental elements. Unique surround information remained rare. I noticed a car that zipped to the right rear at one point, and a spear flew to the back channels as well. Otherwise, I felt the mix stayed with general atmosphere, and that aspect of track was pleasing. The effects seemed fairly believable, and the nice stereo music add pizzazz to the package. Audio quality worked fine; Part 3 offered the best sound of the first three films. Speech was generally natural and clear, without edginess or other issues. Effects didn’t show great vivacity, but they seemed acceptably concise and accurate. Music fared nicely, as the score was bright and dynamic. The track wasn’t enough of an improvement over its predecessors to warrant a different grade, but it worked well. How do the picture and sound of this 2009 disc compare to the 2009 SE DVD? Both offered identical transfers, so don’t expect big improvements. Audio remained the same, and the visuals weren’t much of a step up from the DVD. The source material meant inherent flaws that wouldn’t go away with Blu-ray. If anything, the movie seemed even softer than ever because of the contrast between the potential definition of Blu-ray and the muddy visuals we got here. Objectively, the movie looked a little better on Blu-ray, but it was still not attractive. I will acknowledge that the 3D version worked better on Blu-ray than it did on DVD. It looked a bit crisper and more involving on Blu-ray. The 3D Blu-ray still was somewhat off-putting and gave me a headache, but I could tolerate it much longer than occurred when I watched the DVD edition. The headache wasn’t nearly as intense, so if you want to see the 3D version, the Blu-ray is clearly the better choice. In terms of extras, we get the same trailer found on the SE DVD. Actually, I counted the inclusion of both 2D and 3D versions of the flick as an “extra” too, but I’ve already discussed that side of things. Both the 2009 DVD and the Blu-ray omit the audio commentary from the 2004 DVD. The Blu-ray adds a few new components. Fresh Cuts: 3D Terror runs 12 minutes, 52 seconds and presents remarks from Crystal Lake Memories author Peter Bracke, 3D supervisor Martin Jay Sadoff, costume supervisor Sandi Love, special effects makeup designer Douglas White, and actors Larry Zerner and Richard J. Brooker. “Terror” looks at alternate ideas for the movie’s story, the use of 3D and technical elements, the design of Jason, some thoughts about the shoot, multiple endings, and the film’s reception and legacy. The brevity of “Terror” acts as its main weakness; it’s just too short to be particularly deep. However, it includes a good mix of notes from the production. We learn a fair amount of interesting facts in this short but sweet program. For the next featurette, we get the nine-minute and 33-second Legacy of the Mask. It includes Bracke, Sadoff, Brooker, Zerner and White. “Legacy” examines the visual evolution of Jason through the first few movies, the choice of the hockey mask and it development over the series. The show adds to the subjects touched on in “Terror” and fleshes out the Jason-related material well. Slasher Films: Going for the Jugular runs seven minutes, nine seconds and features Brooker, Zerner, make-up effects designer Tom Savini, composer Harry Manfredini, Dark Delicacies Book Store owner Del Howison, and actors Tony Todd, Tony Moran, Ari Lehman, and Robbi Morgan. The participants reflect on what makes horror flicks work. The show has its moments but it’s a bit too general to really satisfy. A continuation of a series started on the releases for the first two movies, Lost Tales from Camp Blood – Part 3 goes for four minutes, 49 seconds. Neither of the first two became terribly interesting, and that trend continues here. Don’t expect much from this forgettable piece of horror piffle. 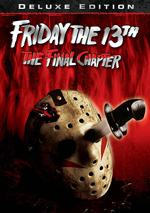 Possibly the most witless and inane movie in the series, Friday the 13th Part 3 suffers from many problems. The film uses 3D effects to entertain rather than any form of storytelling or characters, so the flick never turns into anything positive. The Blu-ray offers pretty average picture plus good audio and a few interesting supplements. If you have the SE DVD, you may want to upgrade to the Blu-ray because its 3D version works better. The visuals remain somewhat off-putting, but I thought they were clearer and less headache inducing. The Blu-ray also includes a few decent extras absent from the DVD. Unfortunately, it still provides the same terrible movie; Blu-ray can’t fix bad filmmaking.